China's president Xi Jinping chose four European countries for his visit: Czechia, Britain, Germany, and France. His 2+day visit to my homeland that began yesterday is viewed as a hint that Czechia was chosen as a Central and Eastern European hub for China to grow its plans in Europe – and to rebuild the Silk Road. This is how you have to bow to the Asian leader if you're just a rank-and-file Czechoslovak billionaire living in a subsidized Stork's Nest. In reality, it seems that the Chinese-Hungarian cooperation remains more genuine than the Chinese-Czech ties. But the Chinese are active in Czechia. CEFC China Energy Company Limited has bought some palaces around the Prague Castle and the oldest Czech soccer club Slavia Prague, among other things. A Chinese investor is sending $100 million to something claimed to be an innovative Czech lithium battery plant. And, to mention a more amusing example, China plans to produce lots of new episodes of a classic Czech cartoon for small kids on the Little Mole (Kerrteh-Czech). Here is an excerpt showing that the mole will get a new Chinese friend, a panda. Many ordinary Chinese talk about the Krtek-Panda alliance. One can see some influence of the "positive" Chinese state media which is cute but despite this sort of brainwashing, there is something genuine about the relationship. Prague become a paradise for the Chinese movie audiences because of a recent Chinese romantic movie, Somewhere Only We Know, and the number of Chinese tourists flowing to Czechia went up, partially compensating the recent drop of the number of Russian tourists. There are more examples of co-operation and the Chinese and Czech presidents have already signed some contracts today. Czech former prime minister and plasma physicist Petr Nečas signed a contract between Delta Medical (CZ) and China and lots of similar things took place. Today, Zeman claimed that $4 billion of future 2016 Chinese investments to Czechia have already been pre-planned. On the contrary, Škoda Auto plans to invest $2.5 billion in China. If China is actually interested in Czechia at all, and there are doubts about it, it's almost obvious that Czechia is only valuable to China to the extent to which it may serve as a key to all of Europe. So some independence we have – that allows us to build friendly and useful business relationships with China – is helpful but it's still important for China to have the feeling that we're not the pariahs. Despite some disagreements, we're arguably more integrated with the Western Europe than e.g. Hungary. To say the least, we have the most boring and least charismatic "professionally mainstream" prime minister in all of Europe which may help in this case, too. President Zeman is obviously the most important pro-Chinese politician in Czechia these days. I would agree if someone argued that the photograph above approximately resembles the friendly pictures of leaders we knew during communism. Zeman has appeared on the official Chinese TV a few times – a sign that he has been thoroughly tested and found appropriate for the Chinese audiences. Whether this is a compliment or a reason to be ashamed is a controversial issue in Czechia, as you may imagine. Zeman's predecessor Klaus has said some diplomatic things for the Chinese media, too. 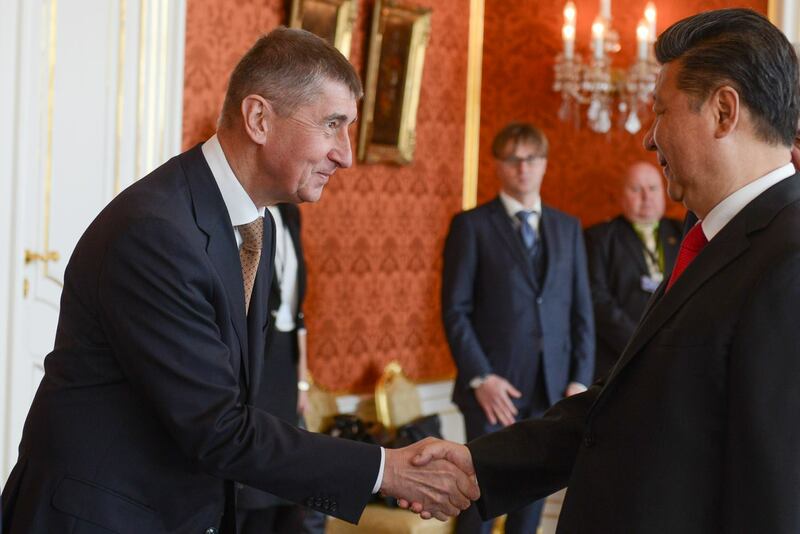 Finance minister Babiš has greeted the Chinese president in a respectful way. As a billionaire, Babiš himself began some business in China, too. Other politicians try to mock Zeman (and perhaps Babiš) and promote a more self-confident and critical attitude to China but it seems to be a consensus among important politicians that the business ties with China are a good thing and it would be foolish to deny the importance of the populous Asian country. Havel is surely turning in his grave if he has an access to YouTube from the grave. This basically positive attitude is different than what we observed during most of Havel's tenure. Havel has been a good friend with Dalai Lama and that would shape his relationship to China and all other things. I must admit that I was mostly a Havlist at those times. (And I also liked Czechia's "leading role" in the international criticisms of Cuba because of its human rights record, something I am much less enthusiastic about these days, although I consider Obama's visit to Cuba to be mostly shameful.) Maybe, one of the things that influenced me around 2010 was the Penn and Teller Bullšit, namely the episode on Dalai Lama and Mother Teresa. These "saints" were quite jerks, I was mostly persuaded to think, and their cruel medieval society could be worse than the Chinese (now market-economy-friendly) communism. Even when we agree that the economic importance of China is substantial enough and it would be silly to boycott it, there are lots of "negatives" when it comes to particular relationships. A high school classmate of mine (or two of them) really hates the Chinese. The Chinese engineers sometimes visit Škoda Works and the relationship typically ends up by the Chinese theft of some Czech know-how – and the Czech engineers are left to cry. I can imagine it can be tough. If some behavior of the Chinese seems unacceptable, an improvement should be looked for during the visits in the future. However, at this moment, I believe that the relationships are in the state of a growth from "very small dimensions" and there's not much room at the presidential level to emphasize what we're annoyed with. Moreover, I feel that President Zeman doesn't really know what bothers the engineers in Pilsen and others about China. We will see. I believe that the trend is such that China will be increasingly compatible with the Western – or "Czech" – civilization as we know it. We're not among those who are terrified by the Chinese competition that could always beat us. It's actually questionable whether China still enjoys a clear "cheap labor" advantage, especially relatively to the post-communist Europe. And the progress that China has achieved in recent decades is probably the main reason why the Czechs are much more willing to welcome the co-operation with China than they would some 20 years ago. By the way, I believe that my blog – and all Blogspot.com blogs – are basically censored in most of China. But the Chinese firewall can't be perfect as this map of visits shows. Nevertheless, the number of visits from China is vastly lower than those from India, for example. Indians are much more likely to speak English but I don't think that this difference fully explains the shortage of Chinese TRF readers.